Cover of first manga volume featuring Kuroko Shirai (left) and Mikoto Misaka (right). 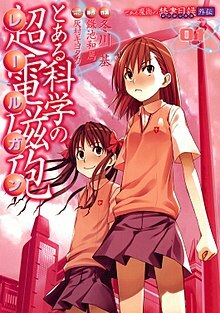 A Certain Scientific Railgun (とある科学の超電磁砲 (レールガン), Toaru Kagaku no Rērugan) is a Japanese manga series written by Kazuma Kamachi and illustrated by Motoi Fuyukawa, which began serialization in the April 2007 issue of ASCII Media Works' Dengeki Daioh magazine. The manga is a spin-off of Kamachi's A Certain Magical Index light novel series, taking place before and during the events of that series. The manga is licensed in North America by Seven Seas Entertainment, who began publishing the series from June 2011. An anime television series adaptation by J.C. Staff aired in Japan between October 2009 and March 2010, followed by an original video animation released in October 2010. A second season titled A Certain Scientific Railgun S aired between April and September 2013. A third season is set to premiere in 2019. The anime is licensed in North America by Funimation. A Certain Scientific Railgun is illustrated by Motoi Fuyukawa and started serialization in the April 2007 issue of ASCII Media Works' Dengeki Daioh. The first volume was released on November 10, 2007 and as of November 27, 2017, 13 volumes have been published. North American publisher Seven Seas Entertainment began distributing the Railgun manga from June 2011. A 24-episode anime television series adaptation, produced by J.C. Staff and directed by Tatsuyuki Nagai, aired in Japan between October 3, 2009 and March 20, 2010. The anime was collected into eight DVD and Blu-ray Disc sets released between January 29 and August 27, 2010, with each volume containing a short story series titled A Certain Magical Index: Kanzaki SS. The series was licensed in North America by Funimation, who released the series on DVD on April 16, 2013. A bonus episode was included with a visual book released on July 24, 2010, and an original video animation was released in Japan on October 29, 2010. A 24-episode second season, also directed by Nagai, titled A Certain Scientific Railgun S, aired in Japan between April 12 and September 27, 2013. It was simulcast by Funimation, who released the series on DVD in North America in two parts on July 1, 2014 and August 19, 2014, respectively. Another bonus episode was released with a visual book released on March 27, 2014. A third season has been announced and is set to premiere in 2019. The anime adaptation of A Certain Scientific Railgun has five pieces of theme music, two opening themes and three ending themes. The first opening theme is "Only My Railgun" by fripSide, and the first ending theme is "Dear My Friend (Mada Minu Mirai e)" (Dear My Friend －まだ見ぬ未来へ－, lit. "Dear My Friend (Toward a Future We Haven't Seen Yet)") by Elisa. The song "Smile (You & Me)" by Elisa, which uses the same tune as "Dear My Friend (Mada Minu Mirai e)", is featured as the ending theme for episode twelve. The second opening theme is "Level 5 (Judgelight)" by fripSide and the third ending theme is "Real Force" by Elisa. "Only My Railgun" appears in Konami's arcade music games Pop'n Music 20: Fantasia, Dance Dance Revolution X2 and Jubeat Knit. For the OVA, the opening theme music is "Future Gazer" by fripSide, the single of which was released on October 13, 2010, while the ending theme is "Special One" by Elisa, the single of which was released on October 27, 2010. For A Certain Scientific Railgun S, it has six pieces of theme music, two opening themes and four ending themes. The first opening theme is "Sister's Noise" by fripSide and the first ending theme is "Grow Slowly" by Yuka Iguchi, the latter of which was released on May 15, 2013. The song "stand still" by Iguchi is featured as the second ending theme for episodes 11 and 14. The second opening theme is "Eternal Reality" by fripSide and the third ending theme is "Links" by Sachika Misawa. The song "Infinia" by Misawa is featured as the fourth ending theme for episode 23. A series of short light novel stories, titled A Certain Railgun SS, were included with the Japanese DVD and Blu-ray Disc releases of A Certain Magical Index and its second season. A visual novel based on A Certain Scientific Railgun for the PSP was released on December 8, 2011 after facing several delays, and comes in a special edition which includes a Kuroko Shirai Figma figure. The opening theme for the A Certain Scientific Railgun PSP game is "Way to answer" by fripSide. The opening theme for Railgun, "Only My Railgun", won Best Theme Song at the 2010 Animation Kobe Awards. ^ "A Certain Scientific Railgun". Funimation. Archived from the original on July 7, 2017. Retrieved December 17, 2018. ^ "Seven Seas Acquires 3 Red Hot Manga From Japan". Anime News Network. July 20, 2010. Retrieved July 20, 2010. ^ "Toaru Kagaku no Railgun Light Novels' Anime Green-Lit". Anime News Network. March 18, 2009. Retrieved March 18, 2009. ^ "Funimation Reveals A Certain Scientific Railgun's English Cast". Anime News Network. February 7, 2013. Retrieved February 7, 2013. ^ "Toaru Kagaku no Railgun OVA Confirmed for October 29". Anime News Network. June 22, 2010. Retrieved June 22, 2010. ^ "Crime Edge, Gargantia, Railgun S Premiere Dates Revealed". Anime News Network. March 8, 2013. Retrieved March 9, 2013. ^ "Funimation to Stream A Certain Scientific Railgun S Sequel Anime". Anime News Network. April 11, 2013. Retrieved April 11, 2013. ^ "Funimation Offers A Certain Magical Index II & Movie on Home Video". Anime News Network. December 18, 2013. Retrieved December 19, 2013. ^ "A Certain Scientific Railgun Gets 3rd Anime Season". Anime News Network. October 7, 2018. Retrieved October 7, 2018. ^ "Newtype: A Certain Scientific Railgun Season 3 Slated for 2019". Anime News Network. November 13, 2018. Retrieved November 13, 2018. ^ "Railgun CD Goods" (in Japanese). Retrieved September 6, 2010. ^ "Yuka Iguchi to Perform Ending Theme for Railgun S Anime". Anime News Network. March 11, 2013. Retrieved March 11, 2013. ^ "FripSide Performs A Certain Scientific Railgun S's 2nd Opening". Anime News Network. July 8, 2013. Retrieved July 8, 2013. ^ "A Certain Magical Index Film's Comiket Promo Posted". Anime News Network. August 13, 2013. Retrieved April 14, 2018. ^ "Dawn Of A Revolution (Silent Party)". A Certain Scientific Railgun S. Episode 23 (in Japanese). September 20, 2013. Tokyo MX. ^ "PSP専用 ガールズトークアドベンチャー『とある科学の超電磁砲＜レールガン＞』" [For PSP Girls-Talk Adventure A Certain Scientific Railgun] (in Japanese). ASCII Media Works. Archived from the original on September 29, 2010. Retrieved October 16, 2010. ^ a b "A Certain Scientific Railgun PSP Game's Promo Streamed". Anime News Network. November 22, 2011. Retrieved November 22, 2011. ^ "Haruhi Film, K-ON! !, Miku Win Anime Kobe Awards". Anime News Network. October 15, 2010. Retrieved October 15, 2010. This page was last edited on 21 January 2019, at 19:53 (UTC).